Neïla Salah grew up in the Paris banlieue of Créteil, dreaming of becoming a lawyer. On her first day at the prestigious Université D’Assas in Paris, she faces off with Pierre Mazard, a teacher known for his outrageous and provocative behavior. To redeem himself, the professor agrees to prepare Neïla for the prestigious contest of eloquence. Pierre could become the mentor she needs… But they must both overcome their prejudices. The script was inspired by the annual rhetoric competitions held in France’s most prestigious law schools, where students are invited to plead on a wide range of subjects in the most eloquent and imaginative way possible. 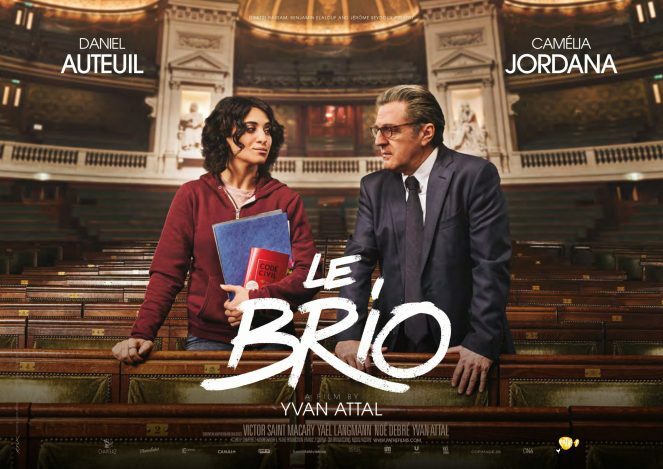 Note on French language: “le brio -nom masculin, éclat brillant dans la conversation” means eloquence. technical package, including widescreen cinematography from Remy Chevrin (Love Songs) that steeps the action in a fair amount of shadow and grain.